Here’s a winner - steps away from the slots, football fans are gathering at the Central Michel Richard Bar/Lounge - no longer needing to make the big choice between game-time TV and their gaming pleasure. Every Thursday - Monday during football season, for pro-football and college games, Central Michel Richard at Revel will serve drink specials and a menu of game-time snacks. Forget the soggy subs and dry wings, football fans can now watch the game and savor touchdown dishes like Bacon & Onion Tart, Crispy Chicken Wings, Bison & Poblano Chili, Bleu Cheese Chips, Fried Chicken, and Beer Battered Onion Rings drizzled with Honey from Central’s Bar/Lounge menu. If you’re going to belly up to the bar for a three hour game make every drink count with Central’s snappy drink prices during the games; $3 domestic beer, $5 Titos vodka drinks (including Bloody Mary’s), and $6 weekly featured wine selections. Drink specials start 30 minutes before each game and end 30 minutes after the final play. The Central Michel Richard Bar/Lounge, located just off the Revel gaming floor, is a lively and energetic venue for small group parties - consider it casino tailgating. Game schedules available upon request. Bet on it! 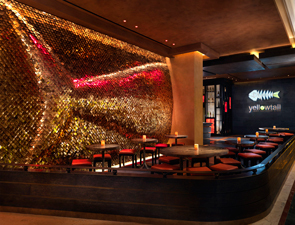 Celebrity Chef Akira Back celebrates four years of Yellowtail Japanese Restaurant & Lounge at the iconic Bellagio with a special anniversary party on Thursday, September 20. Join Chef Akira Back and other invited guests as they reminisce on the past, toast to the future, and indulge in stand-out dishes - including the Big Eye Tuna Pizza and Lobster Carpaccio - that have made Yellowtail a culinary staple on The Strip. 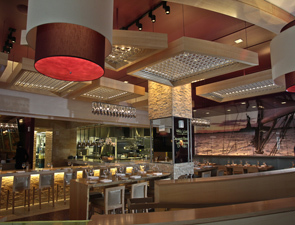 Rick Moonen’s rm seafood at Mandalay Bay Resort & Casino is allowing guests to break from the traditional happy hour with an early evening menu that celebrates sustainable seafood and award-winning cocktails. Offered Tuesday through Saturday, from 7pm to 10pm, guests can escape to the upstairs lounge and indulge in a variety of extraordinary items at unbeatable prices. The special menu offers exceptionally fresh and sustainable seafood bites for under $10. Highlights include Crab Cake Sliders with brioche buns, chipotle aioli and heirloom tomatoes; Spicy Shrimp Lettuce Wraps with ponzu sauce; Thai Prawn Shrimp Cocktail; Citrus Cured Salmon Flatbread; Rhode Island-style Calamari with sweet and spicy cherry peppers; East or West Coast Oyster Sampler; Buffalo-style Blue Point Oysters; Surf & Surf Roll made with shrimp, crab and avocado; and the Taka Roll made with fluke tempura, spicy mayo, avocado and sweet soy. Perfect for parties of two, the menu also features delectable wine pairings such as The Class Act which includes ½ oz of Spanish Oscetra Caviar served with potato waffle and traditional garnishes and two glasses of Nicolas Feuillatte champagne ($99); and The Aphrodisiac which features 12 oysters on the half shell and two glasses of Juve & Camps Brut and Rose Cava ($60). For those who crave something sweet, The Sweet Tooth offers dark chocolate coulant, brandy strawberries and cherries, Amaretto semifreddo, brown sugar streusel and a glass of Taylor-Flagate LBV Port ($24 each). In addition to these a la carte and paired items, guests also can enjoy specialty handcrafted cocktails created by award-winning lead barman JR Starkus. The list includes such favorites as Tangerine Honey made with Tangerine Vodka, Aperol, honey and lemon; Off the Cuff which blends Bulleit Rye, Drambuie, honey, lemon and barrel-aged bitters; and My Friend Jenny that combines Corazon Tequila, St-Germain, fresh-pressed pineapple, Bittermans, tiki bitters, lime, Orgeat and mint. Each cocktail is only $7. An array of wine flights also are available for just $12 including a selection of Old World Whites, West Coast Reds and Dessert Wines. 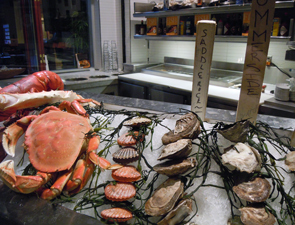 For more information, visit rmseafood.com or call (702) 632-9300. Throughout the month of September, The Mirage is celebrating National Bourbon month with specialty bourbon cocktails and events. The beverage professionals at The Mirage have carefully crafted cocktails that highlight the flavors of this truly American spirit. The specialty cocktail list is below. On Tuesday September 18 from 4 p.m. - 5 p.m. inside Onda Wine Lounge, legendary Knob Creek Master Distiller Fred Noe will be hosting a meet and greet. He will be sharing his keen knowledge of bourbon and signing autographed bottles of The Mirage’s very own special selection of Knob Creek Single Barrel Bourbon. Simple Syrup, garnished with a sugared rim. Tonight, Hearth will host A Night to Honor Our Friends, a charity dinner featuring five top chefs. Chef and owner Marco Canora has invited his fellow toques to prepare a five-course dinner in honor of two Hearth family friends recently diagnosed with A.L.S., or Lou Gehrig’s disease: former Hearth server Kevin Swan and chef Gerry Hayden. The dinner benefits A Life Story Foundation, an organization started by Swan that helps raise awareness for the disease. Guest chefs April Bloomfield (The Spotted Pig, The John Dory Oyster Bar, The Breslin), Seamus Mullen (Tertulia), Carlo Mirarchi (Roberta’s) and pastry chef Claudia Fleming (North Fork Table & Inn and wife of Gerry Hayden) will join Canora in the kitchen, each preparing a single course with a beverage pairing. Full menu is below. $250 per person (all inclusive). All profits go to the foundation. Portland, Ore.-based Moonstruck Chocolate Co. anticipates the 2012 election season with its whimsical chocolate truffles in the shapes of the country’s iconic political mascots, an elephant and a donkey. 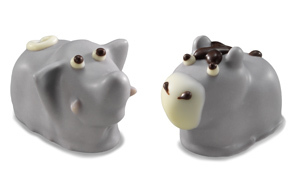 Both truffle mascots feature dark chocolate ganache hand-formed into an adorable donkey or elephant and enrobed in naturally colored and hand-decorated grey ivory chocolate. A box of four truffles is available for a suggested retail price of $15. The truffles are also available for bulk purchase at $3.75 a piece. For the revelers who prefer to rise a tad late, and those who like to lunch a wee bit early, the ideal Saturday/Sunday meal is Brunch. From 10am-3pm every Saturday and Sunday, Central Michel Richard at Revel perfectly combines breakfast and lunch menus to satisfy all expectations of the hour. For French toast with bacon, or a burger on a toasted bun, it’s the perfect spot to grab a spork and nosh. Chef Michael Williams features breakfast items front and center, in addition to the full lunch menu. Continental favorites start with Croissants, Chocolate Croissants and Blueberry Muffins, and Smoked Salmon Rillette & Brioche. Chef inspired presentations are eye-openers with Crème Brule French Toast topped with wild berries and bananas, and Croque Madame topped with a fried egg and served with salad. 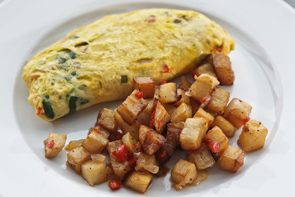 For the traditionalist, a Choice of Omelets, and Eggs Any Style are staples with sides of bacon, sausage and home fries, and for the health-conscious diner, the Berry Parfait with Raspberry Sauce or a bowl of Seasonal Fresh Fruit are favs. On the lunch side Central’s signature “gougeres” (cheese puffs) start every meal off with a smile. Pair them with a goat cheese Caesar salad, bacon & onion tart or “La Quercia” prosciutto plate. Sandwiches selections are plentiful; think Central’s infamous burgers - Lamb, Tuna, chicken, classic Beef, or the award winning Lobster Burger - try a piled high Corned Beef Sandwich, or colossal Crab Cake.. Other lunch dishes are also sure to please, enjoy Tartare of Filet Mignon with French Fries, Salmon with Black Bean Sauce and Fall Vegetables, Fried Chicken with Garlic Mashed Potatoes, or Mussels with White Wine and Garlic. 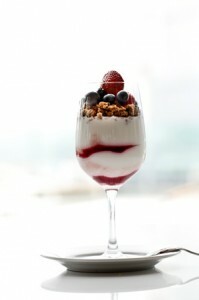 Whether you are here for breakfast or lunch, you never want to skip dessert when you are in a Michel Richard restaurant! Central features classics like Lemon Meringue Tart, Chocolate Lava Cake, Cheesecake, and a Banana Split which is a delightful shared experience. Central is a perfect spot for celebrations and holidays - with appetizer plates sized for the table, and a multi-tiered Celebration Cake, served with a dazzling sparkler candle. For guests with a packed activity schedule, eager to hit the casino or local sightseeing, the Central Bar/Lounge offers a quick grab-and-go pastry bar serving coffee, croissants, and pastries. Ideally located just off the casino floor, the Central Pastry Bar is on the way to the retail shops and self-parking area. You’ll hardly lose your stride, and it’s as yummy as a row of cherries. 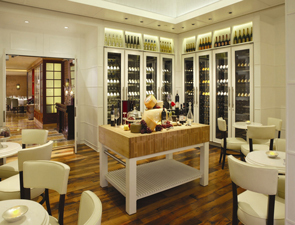 Central at Revel is the destination of choice for great food served in an attractive, yet unpretentious atmosphere. 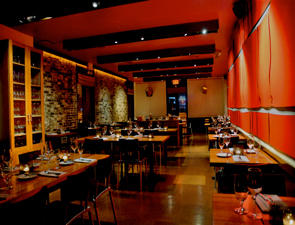 The staff is knowledgeable and friendly - and dedicated to ensure your dining experience is deliciously fun. The highly anticipated 2012 Food & Wine All-Star Weekend Oct. 5-7 is auctioning off the Ultimate Foodie Getaway package on Charitybuzz.com, the leading destination for online charity auctions, valued at $7,500 with all proceeds benefitting The Public Education Foundation. World-renowned celebrity chefs including Masa Takayama, Jean-Georges Vongerichten, Joël Robuchon, Hubert Keller, Rick Moonen and Michael Mina plus the weekend’s host Gail Simmons, have come together to create an elite culinary experience for the highest bidder to indulge in during the third annual epicurean weekend. The winner and a guest will enjoy luxurious accommodations in a world-class resort, admission to the weekend’s culinary events, exclusive one-on-one time with celebrity chef superstars and the opportunity to taste the finest array of wine and cuisine. 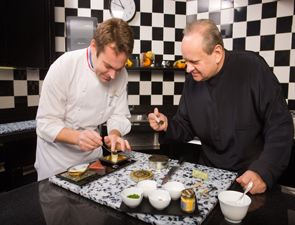 Additionally, an “All-Star Kitchen” will enhance the package, featuring treasured culinary items the participating chefs love to use in their kitchens such as cookbooks, a chef’s jacket and more. The auction’s beneficiary is The Public Education Foundation. The Foundation is a nonprofit Nevada organization dedicated to cultivating innovative strategies to improve public schools, including the expansion of arts education. For more information about the auction or to begin bidding on the Ultimate Foodie Getaway package, visit www.charitybuzz.com/MGMVegas through September 25. 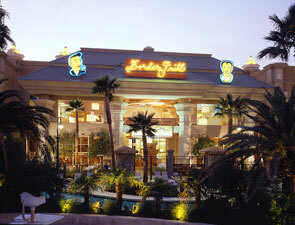 Border Grill is just steps away from the Mandalay Bay Events Center, for those guests attending the holiday performances, and is also located right off of the pool for sunbathers who need tasty holiday refreshers. For the first time ever Jeni’s Splendid Ice Creams will be bringing their “Street Treats Truck” to the streets of New York City. Jeni’s first started scooping from the truck at Meatopia on Sat/Sept 8, and then they will hit the city streets, handing out free scoops in front of several of their retail partners in Manhattan and Brooklyn through Sat/Sept 15. The truck will offer four Jeni’s Splendid Ice Creams summertime flavors: Sweet Corn & Black Raspberries, Roasted Strawberry Buttermilk, Salty Caramel and Lemon & Blueberries Frozen Yogurt. 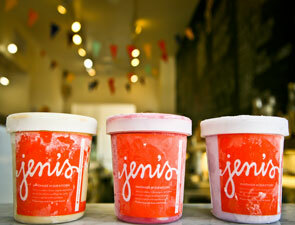 For real time updates on Jeni’s Street Treats Truck, check blog.jenis.com/nyc.